Plants comprising pseudoparenchymatous base bearing many upright axes. Plate-like base up to 150 µm in diameter, formed by adjacently-joined, branching filaments, cells ca 5 µm in diameter, slightly longer than broad. Erect filament arising from any cells of the basal plate, oldest filaments in the centre, up to 200 µm tall, with sparse indeterminate laterals. Cells in mid to distal parts of erect filaments 7-7.5 µm in diameter, narrowing to 5-6 µm near the base; 1-2 times as long as broad. Cells with one central stellate chloroplast and one central pyrenoid. Monosporangia on erect filaments, in second rows, sessile or pedicellate, ca 8 X 7-7.5 µm. No other reproductive structures seen. Recorded from Tsitsikamma to Mntafufu, Transkei (32-45). Epiphytic on various Codium species, mainly C. platylobium. Type locality: Hluleka, Eastern Cape, South Africa (Stegenga 1985). Acrochaetium hlulekaense. Habit, on utricle of Codium. 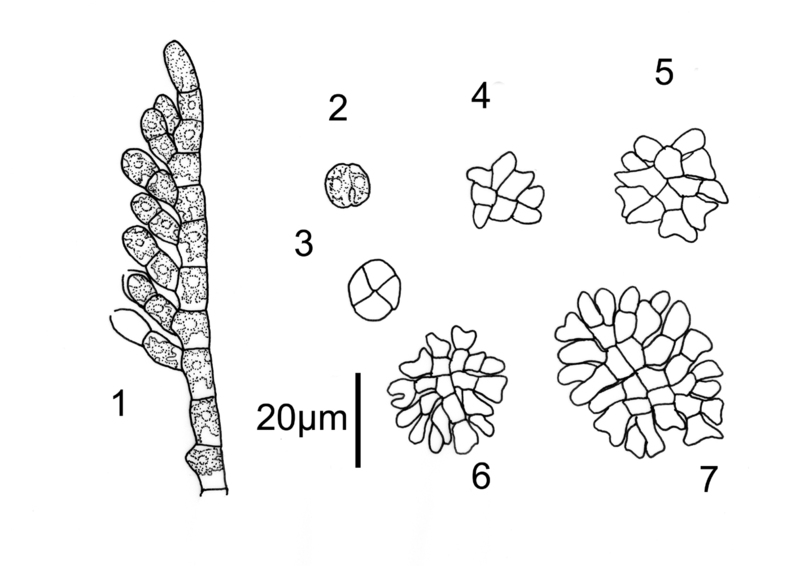 (Re-drawn from Stegenga 1985, Fig 6). Acrochaetium hlulekaense. 1. Detail showing chloroplasts in vegetative cells and monosporangia. 2-7. Germlings (plants from the type specimens). (Re-drawn from Stegenga 1985, Fig 6). Stegenga, H. (1985). 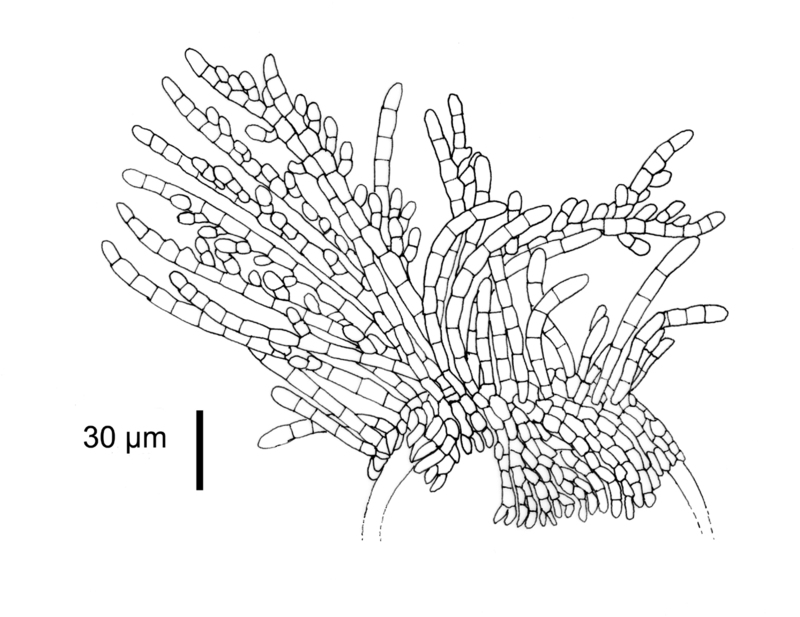 The marine Acrochaetiaceae (Rhodophyta) of southern Africa. South African Journal of Botany 51: 291-330, 25 figs, 1 table.